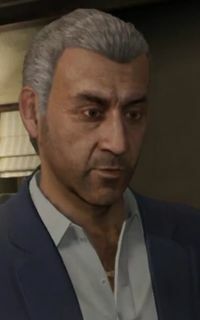 Martin Madrazo is a character in the HD Universe who appears as a supporting character in Grand Theft Auto V and as a main character in Grand Theft Auto Online. He is voiced by Alfredo Huereca. Martin Madrazo was born in Mexico and, in 1983, married his girlfriend Patricia Madrazo. The two later moved to La Fuente Blanca in Vinewood Hills, Los Santos. Madrazo, by this time, had also become the leader of a Mexican-American drug trafficking gang. He continues his operations in Los Santos while posing as a "legitimate businessman" although his reputation is well known, with Franklin Clinton telling Michael De Santa not to mess with him. He had also been put on trial in the past before a witness turned up missing, resulting in the case being dropped. By 2013 he begun cheating on his wife with Natalia Zverovna, buying her a stilt house, owns another house, and was about to be put on trial. Martin employs an unnamed associate to hamper the case against him by killing the investigating DA, killing a possible witness, killing a former female employee, killing a judge, killing the editor of the Daily Globe, killing a former friend at Fort Zancudo, killing twelve jurors and ambushing an FIB team to retrieve some documents. Madrazo also has him/her work for his own operation by stealing some cocaine, stealing a truck full of weapons, stealing a shipment of televisions from the Ballas, destroying two cement trucks loaded with drugs, stealing cocaine from Merryweather Security Consulting, killing members of The Lost Brotherhood operating a brothel in Sandy Shores, escorting an associate, Juan, to his house, stealing a van and protecting an associate from Merryweather mercenaries. Later in 2013, Michael De Santa pulls down the deck of Madrazo's Vinewood Hills modernist mansion, believing that the house belonged to Amanda's tennis coach Kyle Chavis. When Chavis calls Michael, Madrazo's Russian mistress Natalia Zverovna declares Michael a dead man, sending a hit squad to eliminate him and his accomplice Franklin Clinton. After Michael and Franklin kill Madrazo's hitmen, Madrazo himself shows up at Michael's house, demanding an explanation for their actions. Michael claims that he does not know who Madrazo is; however, Franklin gives Michael Madrazo's backstory. Madrazo spares Michael and Franklin's lives; however, he instead forces Michael to refinance the rebuild of his mistress' house at $2.5 million. The incident forces Michael to come out of retirement; however, the success of the Vangelico heist gets Michael the money needed to appease his debt to Madrazo. Madrazo is impressed with Michael for keeping his word to repay him. Madrazo later hires Michael and Trevor Philips to recover files from his cousin Javier Madrazo, who plans on testifying against him. Michael shoots down the private jet Javier is on with a powerful anti-aircraft gun while Trevor raced to the wreckage to recover the files and assassinate Javier if he survived the crash. When Madrazo fails to pay Michael and Trevor, the latter cuts off Madrazo's ear and kidnaps his wife Patricia. The kidnapping forces Michael and Trevor into hiding in Sandy Shores where they live with Patricia, who is allowed to walk around freely. Should Trevor or Michael enter Los Santos during their exile, Madrazo sends hit men after either protagonist. If they outrun or kill the hit squads, Madrazo calls the protagonist, warning them that he will send more goons their way should they stay in town. After Trevor and Michael derail a Merryweather high security courier train, Michael sends the cargo they recovered, an Aztec fertility statue, to Lester Crest to give Madrazo as a peace offering to end the vendetta. Martin accepts the offer, and Trevor later returns Patricia to a visibly frightened Madrazo who agrees not to mistreat or cheat on his wife. This page was last modified on 28 December 2014, at 17:20.